The "Suicide Squad" in action. 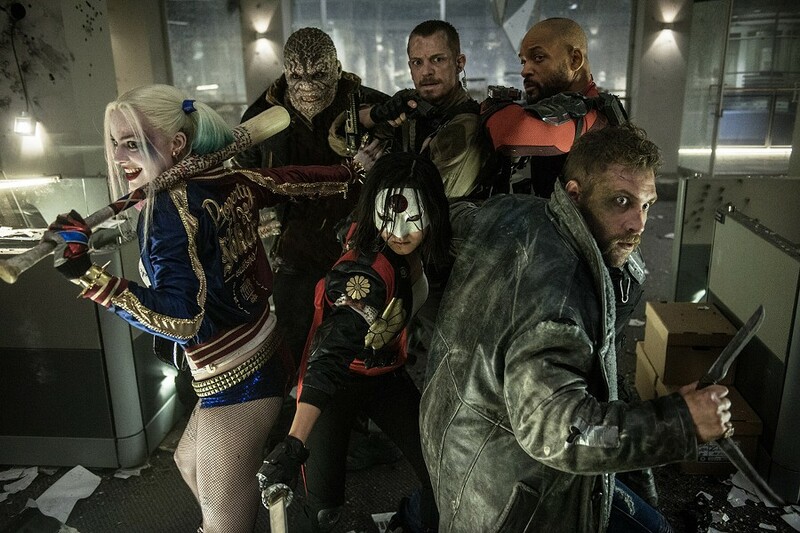 It gives me no pleasure to report that DC's supervillain team-up flick, "Suicide Squad," isn't a good movie. I take no joy in further stoking the flames of rivalry between DC and Marvel; as a fan of many in DC's stable of characters, I want nothing more than to see good films based on the characters I've loved since I was a kid. No critic goes into a film wanting to hate it -- who wants to be forced to sit through a movie they're not going to enjoy? But DC keeps pitting its films directly against Marvel's, creating a one-to-one correlation where you can't help but compare. "Batman v Superman" revolved around remarkably similar themes as "Captain America: Civil War," and now "Suicide Squad" suffers by being held up against "Guardians of the Galaxy," another film that introduces an entirely new group of anti-heroes, and watches as they come together, backed by a jukebox soundtrack of pop hits. Unfortunately, the contrast keeps working to DC's detriment. I'd gotten my hopes up ever so slightly: "supervillains save the world" is a great hook, and the "Suicide Squad" trailers promised a shift in tone from previous films of the DC universe, moving away from the self-seriousness that made "Man of Steel" and "Batman v Superman" such slogs to get through. But from the first act, when the team's creator -- ruthless government agent Amanda Waller (Viola Davis, clearly having fun) -- dumps a load of exposition on us, the film is one misguided decision after another. We're introduced to our cast of characters one-by-one, with a PowerPoint presentation of trading card-like infographics. The title cards are so chaotic, constantly moving, using crazy fonts, and zipping by so fast that they're impossible to read, which completely negates whatever purpose they might have served. In rapid succession, the film introduces Deadshot (a decent Will Smith), Harley Quinn (Margot Robbie), Rick Flag (Joel Kinnaman), Captain Boomerang (Jai Courtney), El Diablo (Jay Hernandez), Killer Croc (Adewale Akinnuoye-Agbaje), and Enchantress (Cara Delevingne). It's such an enormous cast that no one registers, not even ostensible leads -- and the only characters the script seems to care about -- Harley Quinn and Deadshot, despite having the benefit of receiving two introductions apiece. There's one character who joins the team with almost no introduction, and you can probably guess what almost immediately happens to him. The film's production was caught between a shift in direction for DC -- when the studio decided that what their films needed was more humor -- and it feels that way. The film is a mess tonally. Motivation and characterization are constantly shifting, and the plot is incoherent, creating the sense that giant pieces are missing. The team's eventual mission is unclear and needlessly convoluted. It doesn't help that the major villain (Enchantress, an ancient witch who possesses the body of archaeologist Dr. June Moone) wouldn't even be a threat if the team hadn't been formed in the first place. Even worse, her big plot involves yet another giant portal in the sky (seriously comic book movies: stop it). Writer-director David Ayer is the talented filmmaker behind tense, action-heavy films like "End of Watch" and "Fury," but here it feels like he got crushed under the weight of the film. Reportedly the trailer house that cut the film's promos came in late in the game to help edit the film. The result is a film that has the texture of a trailer. It's wall-to-wall with on-the-nose music cues that lean on our familiarity with the tunes in order to replace actual character development. But also like a trailer, there are some striking images that work out of context: I enjoyed the homage to artist Alex Ross' painting of Harley Quinn dancing with the Joker; Moone's first transformation into the Enchantress is a nifty effect, although every subsequent use of the character is laughable; and the aftermath of Harley's dive into a vat of acid looks pretty, even if that entire sequence is a minefield of problems. It's tough to judge Jared Leto's Joker, since the character adds nothing to the film -- although supposedly most of his scenes were left on the cutting room floor. It's inexplicable why the Joker isn't the big bad of the film. Not only would he have made a better villain, it would also have served to justify the presence of Harley Quinn -- seriously, how much help is a crazy woman with a baseball bat against a centuries-old, all-powerful sorceress? Anyone who saw last year's heist caper "Focus," knows that Margot Robbie has some electric chemistry with Will Smith, but that barely comes across here. Robbie commits to the role, but she's let down by the writing and is forced to toss off one clunky one-liner after another. Plus, Harley Quinn is a tricky character to get right. Involved in an abusive relationship and dependent on a psychopath, when written incorrectly, she can seem to lack agency. Ayers' script doesn't bother explaining what makes her fall for the Joker in the first place, and without that kind of crucial development, we're left with only the most problematic aspects of the character. As a whole, the film's portrayal of women is questionable at best. All are either hyper-sexualized or evil, and each have motivations only in relation to the men in their lives. There are grains of something fun and enjoyable to be found amid the rubble of "Suicide Squad," but the film feels as though it were put together by one of its mentally-unstable protagonists. I wouldn't say no to another shot at bringing these characters to movie screens, but it desperately needs a cohesive, singular vision to see it through. C'mon DC, I'm rooting for you. Check back on Thursday for additional film coverage, including reviews of "Pete's Dragon" and "Indignation," based on the Philip Roth novel.